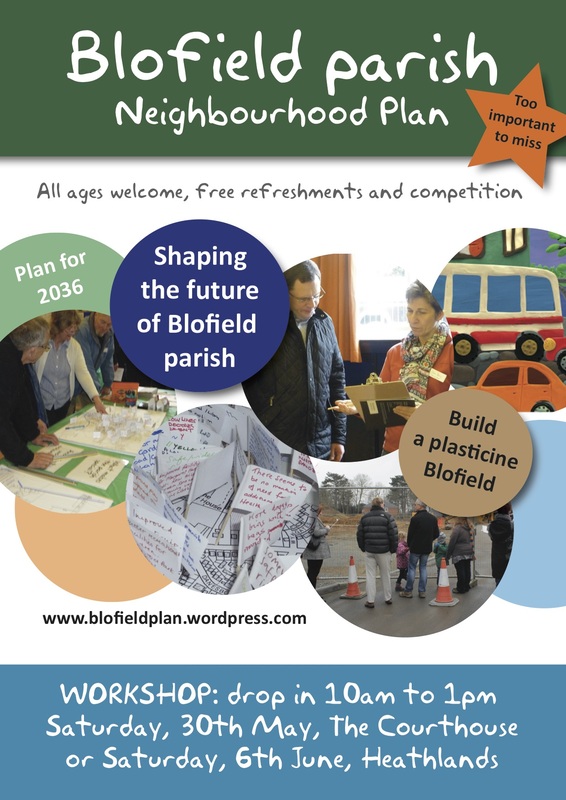 Blofield parish Neighbourhood Plan is a community-led document for guiding the future development of the parish. It is the first of its kind for Blofield and a part of the Government’s current approach to planning. It has been undertaken with extensive community engagement, consultation and communication. To meet the regulations, a Consultation Statement has been produced. The steering group has endeavoured to ensure that the Neighbourhood Plan reflects the desires of the local community and key stakeholders, which have been engaged with from the outset of developing the Plan. 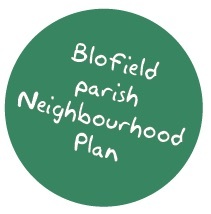 In November 2014 Blofield Parish Council agreed that a Steering Group of interested residents should be formed to guide and produce a Neighbourhood Plan. A general flier was posted on noticeboards and sent to local organisations and businesses in the parish. An article went in Focal Point (the parish magazine). Blofield parish residents were asked to come forward if they were interested in being part of Steering Group. The second stage of community engagement were two ‘Walkabouts and Workshops’ delivered on 14 February at the Margaret Harker Hall (Blofield) and 21 February 2015 at Heathlands Community Centre (Blofield Heath). 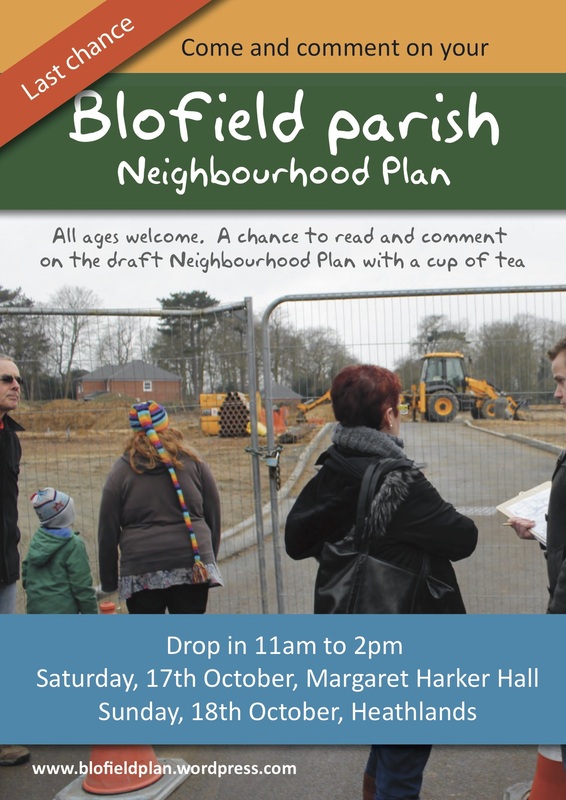 Blofield parish includes the villages of Blofield and Blofield Heath, therefore these and future events were held in both villages to enable good attendance. Key theme areas emerged which formed objective and policy areas: Housing and the Built Environment, Environment, Social and Cultural (later changed to Community), Economy, Services, Transport and Connectivity. From this the Steering Group formed a draft vision, aims for the Plan and a set of objectives. The full dataset can be found a the bottom of this page. a. ‘Consultation conversations’ – meetings were held with a range of interest groups to discuss the aims and objectives of the Plan, and to gather policy ideas. Detailed notes were made of each meeting, can be found at the bottom of this page. Policy ideas were drafted using the qualitative data from the consultation conversations. b. ‘Policy Ideas Workshop’ – open to the wider community on Saturday, 30 May at the Courthouse (Blofield) and Saturday, 6 June 2015 at Heathlands Community Centre (Blofield Heath). Residents were encouraged to drop in to vote and feedback comments on a list of 48 policy ideas. From here, the Neighbourhood Plan Steering Group refined the ideas and began drafting policy. c. ‘Village events’ – a stand with display information at Blofield School Fete on 20 June and Blofield Heath Village Fete on 19 July 2015. Further information was also collected on policy ideas. The final stage of consultation and community engagement involved sharing the draft pre- submission Neighbourhood Plan and Sustainability Appraisal with residents and to launch the formal six-week consultation period. An exhibition of policies took place on 17 October at the Margaret Harker Hall (Blofield) and 18 October 2015 at Heathlands Community Centre (Blofield Heath). For six weeks, hard copies of the Neighbourhood Plan and Sustainability Appraisal were put in 24 community locations, with a Consultation Response form. Electronic copies were available on the blog and Blofield Parish Council website. Consultation Response forms were sent to residents, parish councillors, district and county councillors, local organisations and business consultees, and stakeholder consultees. All consultation responses and amendments can be found at the bottom of this page.